My kids love to bring lunch to school and I hate waste plastic bags. We love using ReUsies. ReUsies is a reusable cloth bag that you can put sandwiches into. When you are done, they are machine washable, so you can just clean them and use them again. We have used our several times for sandwiches, but have found many other uses. For example, my son loves storing his lego characters in his, while my daughter loves putting her hair accessories in hers. It is a really useful bag that can be transformed into many different items. We have used it to hold snacks as well, and we just toss it in the laundry when we are done. 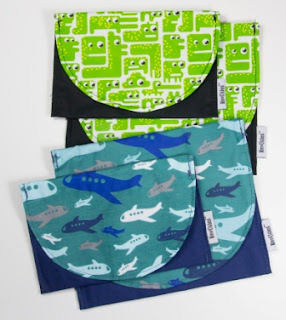 The bags come in a variety of colors, so you can get a ReUsie that matches with your child's personality. We had a lot of fun with ours and used colorful washable markers to personalize them, and just washed then when we were done! Want a ReUsie of your own? Enter below for your chance to win! The winner will be able to choose a 2 pack of their own! Happy Fruit is my favorite! i like the happy fruit!! the heavy metal for my husband! I love the sharks! My sons love the beach and we could use a reminder of summer as we head into the dark, long days of winter! I would get the Whooo's Looking! My boys would like the heavy metal! I like Whoo's lookin and Whimsy! I would pick the Camo print. I like the Whoo's Looking Large. I love the Doe Eyed ReUsies bag! Super cute!